Preheat the oven to 170°C (340°F) and line two large baking trays with baking paper. Beat together the eggs and sugar in a bowl, then add the flour, baking powder, salt and butter and combine energetically using a whisk. (You could also do this with a food processor.) Add the vanilla, nuts and drained sultanas and stir until well combined. The mixture will be quite thick. Form the dough into walnut-sized balls, then flatten them slightly and press a whole almond into the top of each one. Place them on the prepared trays, leaving plenty of room for spreading, and bake for 20–22 minutes until golden. Allow to cool for a few minutes, then transfer to a wire rack to cool to room temperature. The biscotti will keep in an airtight container for a couple of days. Biscotti del pescatore are found in bakeries along the coast of Le Marche; mounds of nutty pastry studded with sultanas perfumed with a hint of rum. They are made without any fuss and keep well in a tin, forgotten for a few days only to be retrieved and dunked happily in a cup of milky morning coffee. Although they typically contain pine nuts, I like using hazelnuts instead (more to do with what is in the pantry than by design), but you can experiment with your favourite nuts. Just remember to toast them – it really does make a difference to the flavour – and keep the quantities the same. My friend Vanessa, who tested the recipe for me, told me she loved the biscotti so much that she ate five that day for breakfast, one after the other. Preheat the oven to 170°C (325°F). Lightly spray three 12-hole mini muffin tins with vegetable oil spray. To make the biscuit base, use a food processor or blender to whiz the biscuits into fine crumbs. 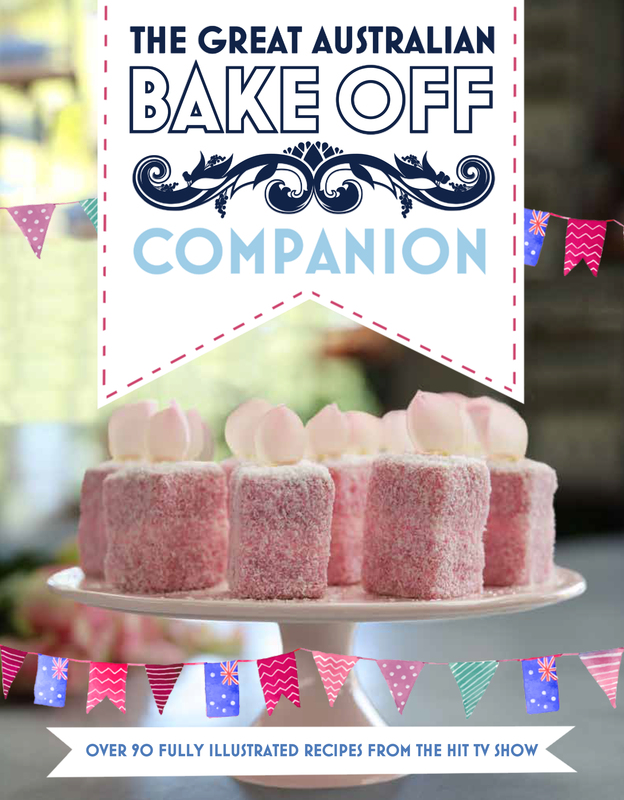 Tip the crumbs into a bowl, add the coconut, sugar and flour and mix together. Pour in the melted butter, golden syrup and milk and mix until combined. Take a heaped teaspoon of the mixture and roll it into a small ball, then press it into one of the muffin holes, and all the way up the side, as if you were making a little clay ‘pinch pot’. Repeat with the remaining biscuit mixture. Combine the caramel filling ingredients in a saucepan. Stir over low heat for about 5 minutes, or until the mixture starts to thicken. Pour the caramel into a jug with a good spout, then three-quarters fill the biscuit cases with the caramel, leaving room for the topping. Transfer to the oven and bake for 20 minutes, then remove from the oven and leave to cool completely. To make the topping, heat the cream in a small saucepan until it is quite hot. Whisk in the chocolate until the ganache is nice and thick, and all the chocolate has melted. Pour the ganache into a small jug, then pour this shiny chocolate topping onto your little caramel kisses. Place the caramel kisses in the refrigerator to set; they will keep in an airtight container in the fridge for up to 1 week. It is almost Valentines Day…again..already, and what better way to say I Love You than sharing a meal or a sweet treat made with love? Here are a few suggestions to make cooking for that special someone, easy. 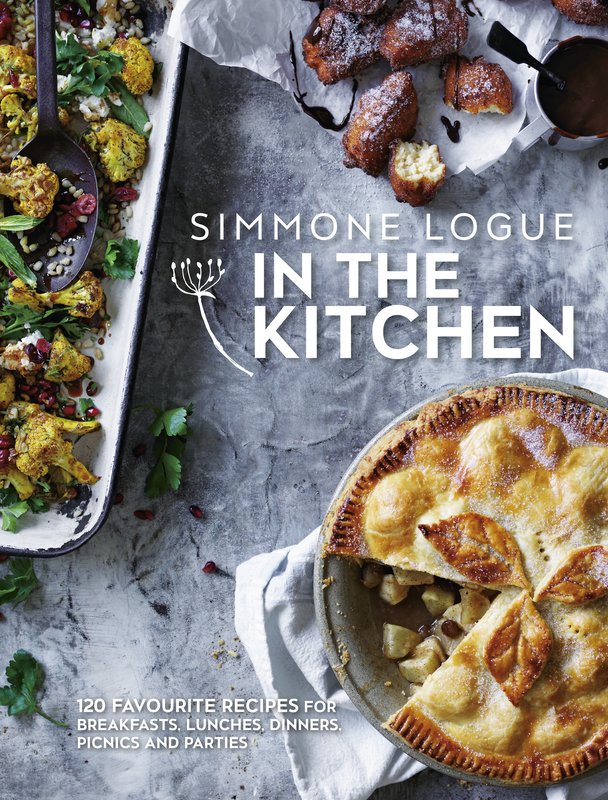 And if cooking isn’t your “thing” how about gifting a book or two? I will have several to give away in the next few days. Temper the chocolate (a) (see pages 12–14). Sift in the red food colouring and mix to combine. Polish chocolate moulds with cotton wool to eliminate any fingerprints. 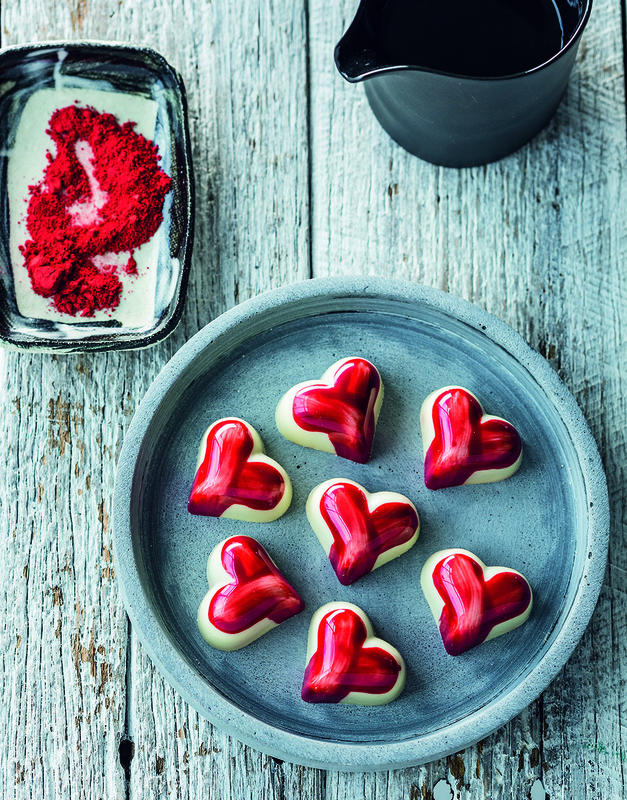 (I have used two heart-shaped moulds for this recipe. All moulds vary in shape and size – select ones you like.) Using your finger or a brush, paint a thin layer of the red chocolate into the base of each mould and scrape the top of the mould with a metal scraper to remove any excess red chocolate from the top surface of the mould. Temper the chocolate (b) (see pages 12–14). Once the first red chocolate layer has set, fill the mould with the tempered white chocolate and scrape the top and sides of the mould to remove any excess chocolate. Tap or vibrate the mould on a work surface from side to side to dislodge any air bubbles trapped on the surface. Turn the mould upside down suspended above a sheet of baking paper and tap it firmly on the side of the mould with a scraper or palette knife to remove the excess chocolate. 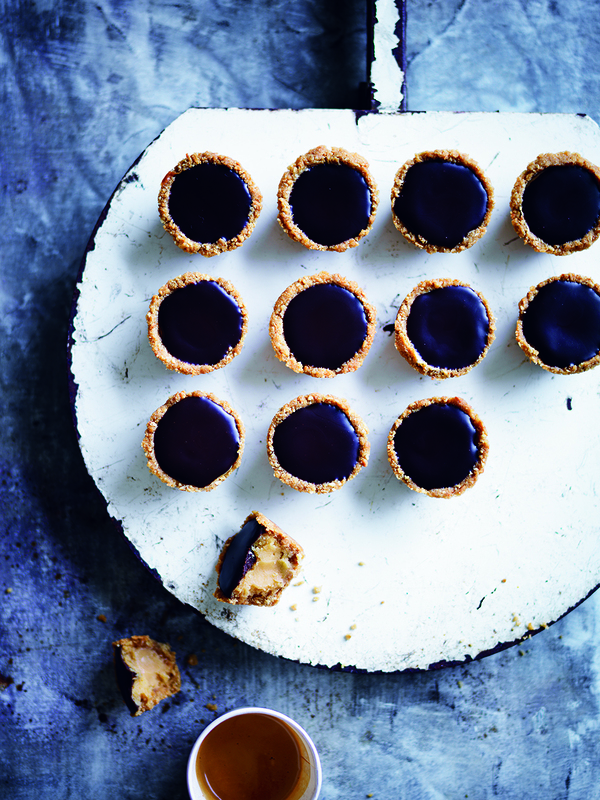 (Once set, the chocolate on the baking paper can be stored and re-tempered for ‘Sealing the mould’ – see page 77.) Scrape the mould while still upside down to remove any drips of chocolate. Turn the mould the right way up and tap and scrape again if necessary. Place the mould on its side to set or if your room temperature is warm, place for a short period in the refrigerator. Put both chocolates in a heatproof bowl. Put the cream and vanilla bean seeds in a saucepan over medium heat and bring to the boil. Pour the hot cream over the chocolate, whisking by hand until all the chocolate is melted and combined. Add the butter, whisking to combine. Scrape the ganache down from the side of the bowl and cover with plastic wrap so it is touching the surface of the ganache. Leave the ganache until it cools to just below 30°C (86°F), then use immediately. Transfer the prepared ganache to a piping (icing) bag with a 5–10 mm (1/4–½ inch) plain nozzle. Pipe the ganache into each chocolate-lined mould, leaving space to seal the mould with more chocolate. (You can also use a teaspoon to spoon the ganache into the moulds.) Leave to cool at room temperature – as long as the temperature doesn’t exceed 23°C (73°F). If the room is too hot, place the ganache in an airtight container in the refrigerator for 1 hour or up to 24 hours before sealing, to enable the ganache to firm up. You can also put the mould in the refrigerator, but for no longer than 15 minutes. Once the ganache has been setting for a minimum of 1 hour in the mould, temper the remaining white chocolate (see pages 12–14) that was tapped out of the mould. If your mould has been sitting for more than 12 hours, warm the surface slightly with a hair dryer. Place a sheet of baking paper under the mould. Spread a layer of tempered chocolate on the base of the mould and tap on the side of the mould with the handle of a palette knife or spatula to pop any air bubbles. Scrape firmly on the surface of the mould with a metal scraper wider than the mould or a metal spatula. Scrape again if needed and then scrape the excess chocolate off the sides of the mould and repeat the process with the second mould. Let the moulds sit at room temperature for 10 minutes and then place in the refrigerator for 20 minutes. Turn the mould over onto a clean work surface and tap to dislodge the chocolates. As soon as they come out, move them gently to the side and tap again if needed. Store the chocolates at room temperature – as long as the temperature doesn’t exceed 23°C (73°F). If the room is too hot, store them in an airtight container in the refrigerator for up to a week. For the dough, place two cookie sheets in the refrigerator or freezer to cool. In a small frying pan over a medium heat, dry toast the fennel seeds until fragrant. Transfer the toasted fennel seeds to a food processor. Add two-thirds of the flour and the salt, sugar, chilli and thyme to the food processor. Pulse the mixture in the food processor until just combined. Add the butter, spreading it evenly around the food processor. Pulse the butter and flour mix together until everything comes together and forms a rough dough. Spread the dough evenly around the bottom of the food processor. Sprinkle the remaining flour evenly over the dough in the food processor. Pulse until it forms a crumb-like mixture. Transfer the mixture to a large bowl. Sprinkle 1 tablespoon water over the dough mixture and fold the water into the dough using a spatula. Repeat this step, folding 5 more tablespoons water into the dough. The dough will be quite wet. Turn the dough out onto a generously floured surface and gently knead to combine. Divide the dough in half. Pat the dough into flat circles and wrap in cling film. Place in the refrigerator to firm up (approx. 30–45 minutes). Preheat the oven to 180°C and line the two chilled cookie sheets with baking paper. Roll out the dough on a sheet of baking paper to a large rectangle. Sprinkle about half the Parmesan cheese onto the rolled dough. Fold up the dough to cover the cheese, like an envelope. Roll out the dough again to a large rectangle. Sprinkle over the remaining Parmesan cheese. Fold up the dough again. Roll out the dough again until 3–4mm thick. Using a 6cm round cookie cutter, cut out 36 round biscuits and transfer onto a lined cold cookie sheet. Rest the cut biscuits in the refrigerator for 15–30 minutes. Brush egg wash over the biscuits. 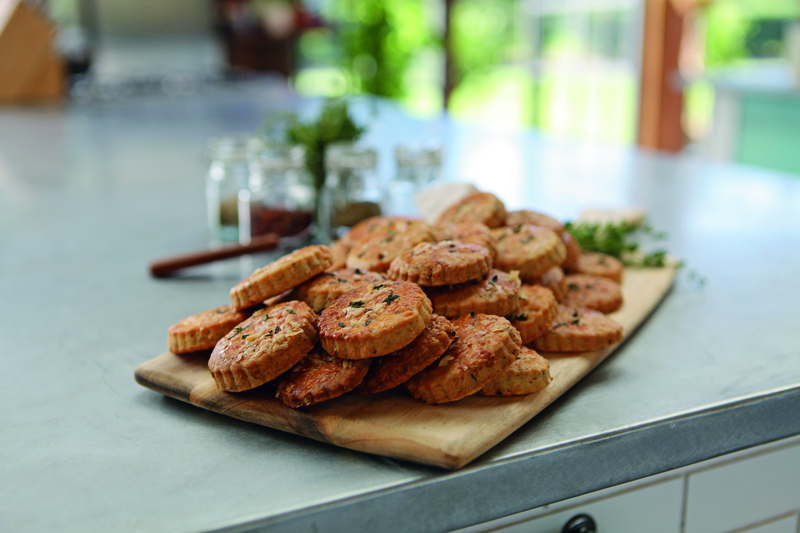 Scatter the extra Parmesan and fresh thyme leaves over the biscuits. Bake the biscuits for 18–20 minutes or until golden. Transfer the cooked biscuits to a cooling rack to cool. 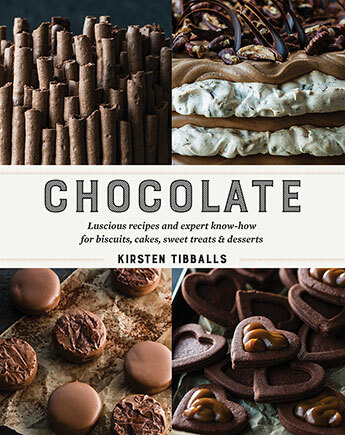 Images and recipes from Chocolate by Kirsten Tibballs (Murdoch Books) RRP $49.99 available now in all good bookstores and online. 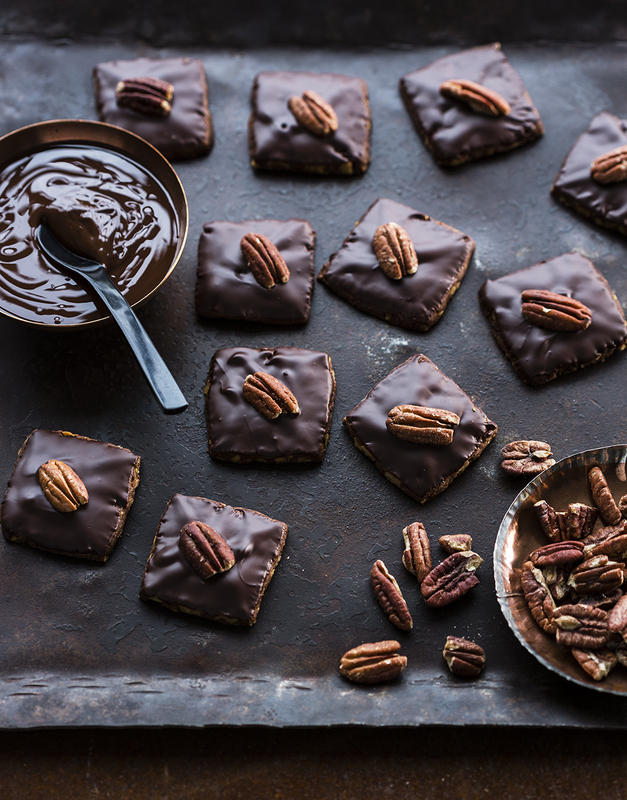 Pecans and chocolate make a great flavour combination in this simple recipe. Feel free to serve these with or without the chocolate coating. Preheat the oven to 160°C (315°F). Put the pecans on a baking tray and roast them for 8–10 minutes. Once cool, roughly chop them. In an electric mixer with a paddle attachment, cream the butter and sugar on medium speed until light and creamy and the butter is fully incorporated – scrape the bowl down at regular intervals. Add the cinnamon and eggs. Melt the dark chocolate in a double boiler or in a bowl in the microwave (see page 12). Add the chocolate to the butter mixture and continue to mix, scraping down the side of the bowl as needed, until combined. Finally add the dry ingredients and chopped pecans. Continue mixing just until combined and a dough forms. Press the dough into an even, flat square, wrap it in plastic wrap and place it in the refrigerator to rest for 1 hour, until firm. Preheat the oven to 170°C (325°F) and line a baking tray with a non-stick mat or baking paper. Remove the dough from the refrigerator and let it sit at room temperature for a few minutes before rolling it out. Lightly dust a work surface with flour and roll the dough out to an 8 mm (3/8 inch) thickness. Cut the biscuits into 4 cm (11/2 inch) squares. Using a small knife, pick up each biscuit and place it on the prepared tray approximately 1.5 cm (5/8 inch) apart, as they will spread a little during baking. (Instead of rolling the biscuit dough out you can simply use a teaspoon and spoon small amounts onto the lined tray.) Bake for 9–10 minutes. Remove from the oven and leave on the tray to cool at room temperature. To make the garnish, preheat the oven to 160°C (315°F). Put the pecans on a baking tray and roast them for 8–10 minutes. Set aside to cool completely. Temper the dark chocolate (see pages 12–14). 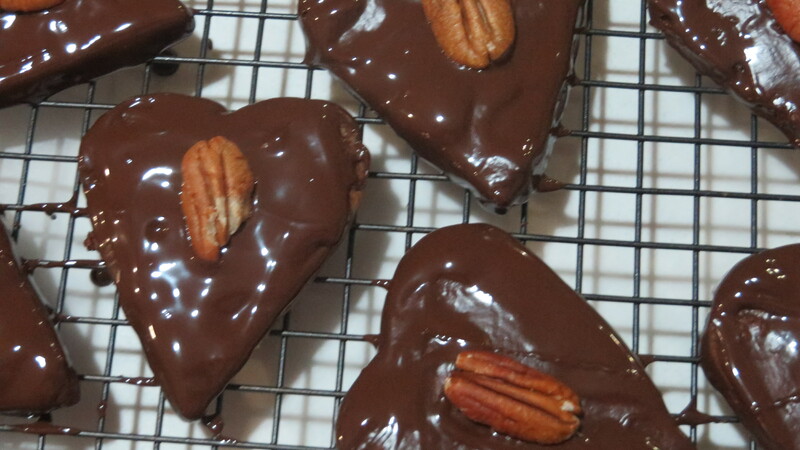 Once the biscuits are cool, dip the top in the chocolate and immediately place a cooled roasted pecan on top. Leave at room temperature to set. These biscuits are best eaten within a week and stored at room temperature in an airtight container. If your room temperature is warm, store them in the refrigerator in an airtight container. My attempt – delicious and so easy! 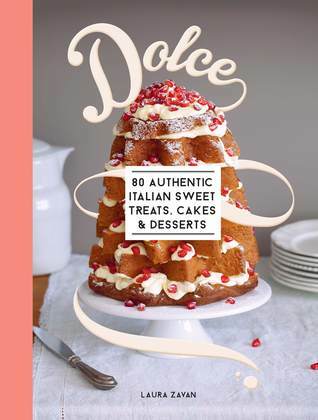 80 easy and authentic Italian recipes for sweet treats, cakes and desserts. 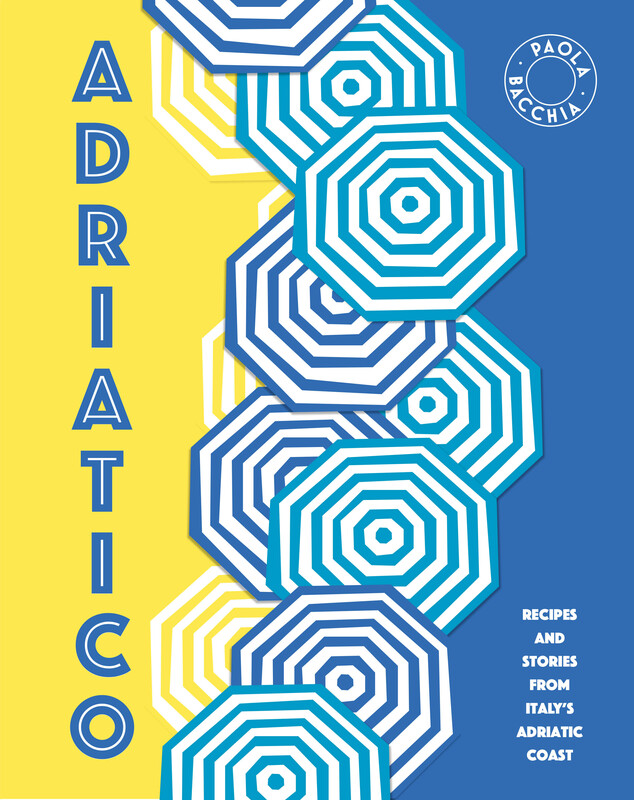 Tiramisu after dinner, panettone at Christmas, an icy lemon granita on a summer’s day. . . the delights of Italy’s many desserts, or dolci, are celebrated around the world; perhaps because, above all else, dolci are about family and simplicity. Laura’s uncomplicated approach to the traditional desserts of her childhood makes Italy’s finest tarts, puddings, cakes and sweets easy for everyone to share and enjoy. There is more! 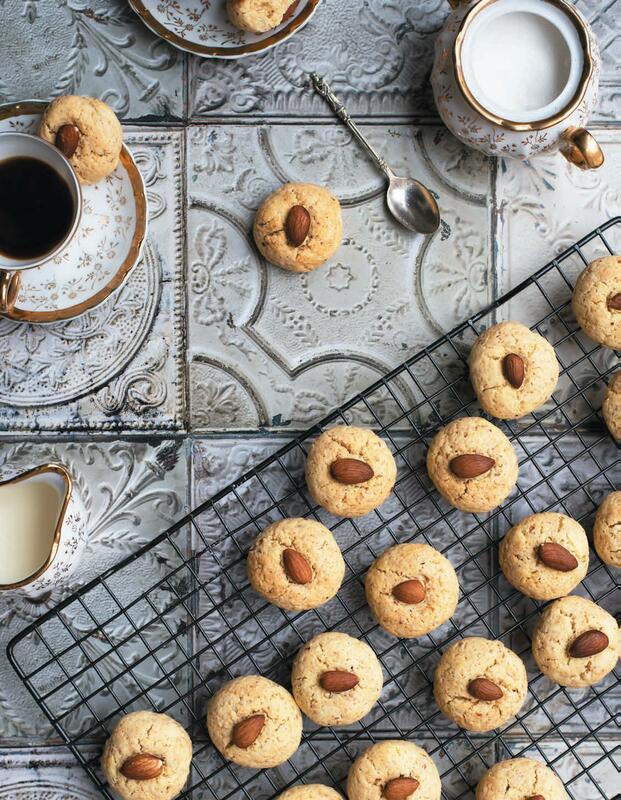 Pastries, cakes, biscotti (who doesn’t love a biscotti with their coffee?) Or some home-made semi – freddo, or ice-cream or granita? Ok I now I have narrowed down my choices: Coffee Panna Cotta, Biscotti, Choc Hazelnut Spread (Gianduja) and I must make Fruit and Nut Turnovers (Tortelli Dolci) purely because they use prune jam and at Christmas a made a few jars to give away and a couple to keep in my pantry. Look out kitchen, here I come!!! I made these delicious and simple to make cookies/biscuits as a snack to refuel the engines of the hard workers making daughter’s new house ready to move into (the workers – husband, daughter and myself) 🙂 There is a fence to keep the Dempsey Dog in – needed immediately, some bricks to the front door (to stop the sand and grit getting in until the gardens are established, painting, sweeping, mopping… packing, unpacking…. ), a busy week ahead! A cup of coffee and a Chewy Chocolate Chip Cookie – are just what is needed to keep us going. 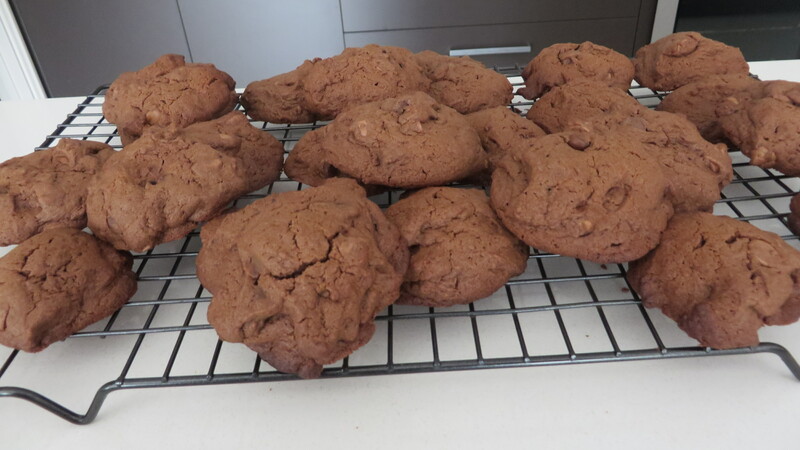 (These are meant to last 5 days in an airtight container – but I think that is wrong – I think 2 days at the most!!) In fact I might just need to try one now. David Herbert’s Best Home Cooking – David Herbert, Lantern. Penguin Aust.